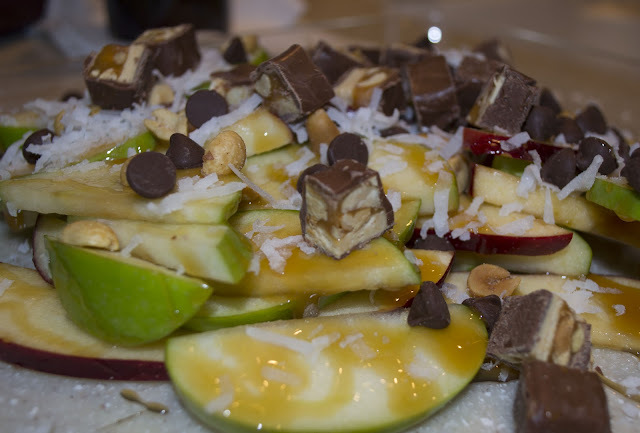 The deal with the apple nachos is that they were AWESOME. And I use the term "recipe" loosely. It's more like an arrangement of foods. Sliced apples (I used red + green, tossed them in a little mixture of orange juice and lemon juice to prevent browning). Milk chocolate chips. Salted peanuts. Coconut. Drizzled caramel. Chopped Snickers bars. I basically took this recipe and made it a smidge less healthy. Sue me. The Snickers were a total impulse buy. I was standing there at the grocery store waiting to check out, ingredients already in my basket, and then I saw the Snickers bar. It was all over! I knew that would make the perfect addition to these "nachos." So yes ... make this. This was the perfect Superbowl Sunday sweet. We just had our friends Linds & Casey over. Linds was due with their baby boy two days prior (on Friday) and still hadn't gone into labor, so this year we all went really low-key. Stayed near home, stayed near the hospital. And it was lovely and perfect! Other than the apple nachos, we had chips with onion dip, mozzarella sticks, and pizza. 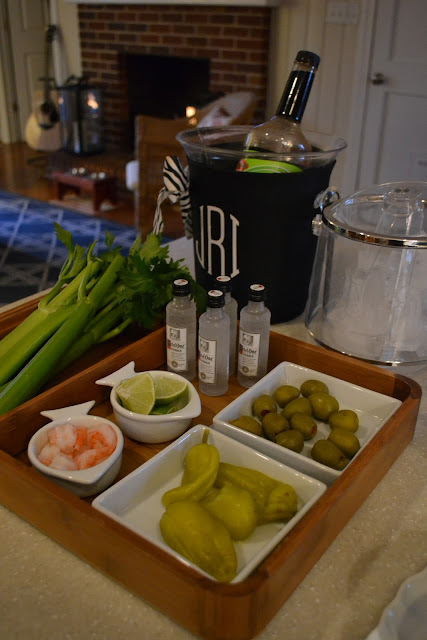 A Bloody Mary bar, too. YUP re: pepperoncini in the Bloody -- also try horseradish pickles. omg. I'll send some from NYC if you don't have them by you! 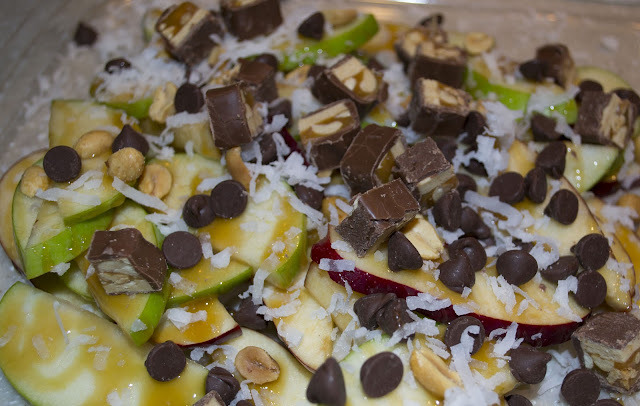 I've made a very similar apple snicker salad and it is delish! I like that yours is more like nachos.. I'll have to try this next time! never heard of the apples nacho thing - interesting! OMG yum!! And your ice bucket? Amazing. 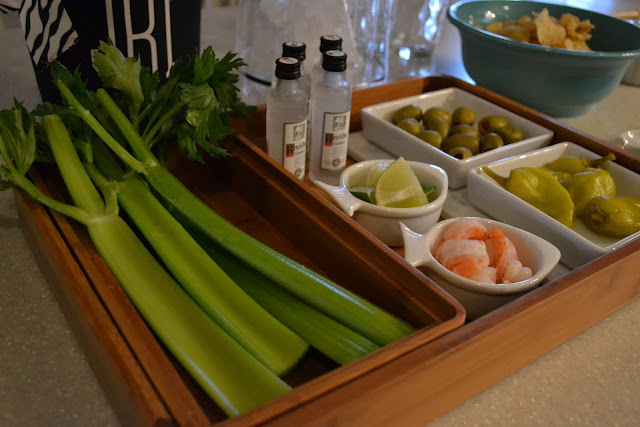 I really love a good bloody mary bar! Yum yum. 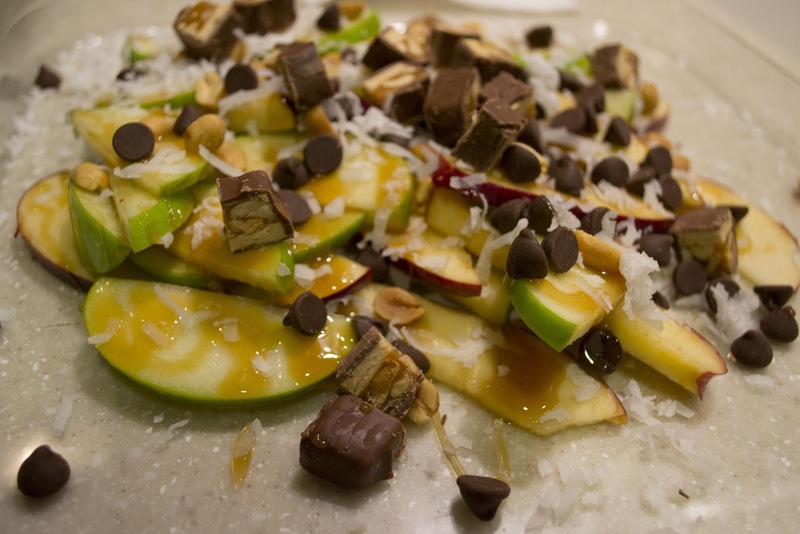 Apple nachos?! Yum! This would satisfy my fruit/sweets craving. You always have the best new twists on recipes! Yummm. I cna't wait to try! Thank you for posting! Looks amazing and can't wait to try it out!! And I die for a good bloody mary bar. 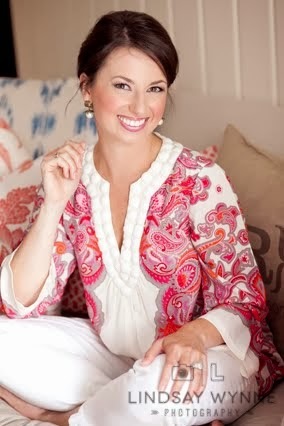 Have you been to Boudreaux in Noda? best in CLT. 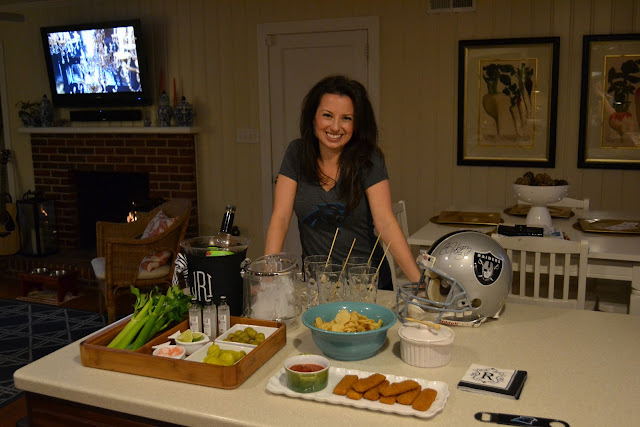 I love your Bloody Mary bar set-up, that is too cute! Those apple nachos need to get in my life. They look delicious! 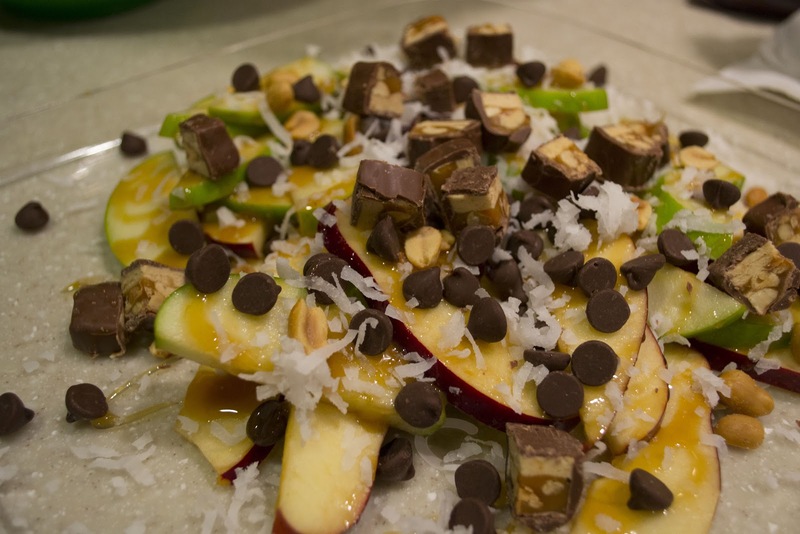 Yum apple nachos look amazing! I will have to try this for our next game night! 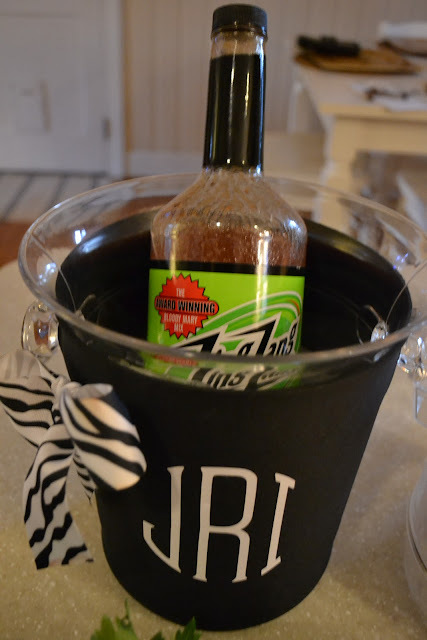 Where is your monogrammed wine cooler from? Everything looks amazing! Those "nachos" look especially delicious. These look AMAZING! So fun and something I will definitely try in the future!